After a scorching day we could feel a storm developing. It was in the air. You could just sense a change in the weather was coming. 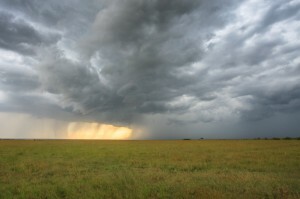 As we headed south towards Keekorok, to our right (West Mara) we could see heavy rain in the area of Mara Serena. Moving in the opposing direction was a second storm system, they were sure to merge. Before the two storms collided, the sun was desperately trying to break through. It looked like an orange fire ball, as if there was fire in the sky. As the two storms started to merge lightening started to strike. We were desperately hoping the storms would not change direction and head toward us. The air was fresh and you could smell the rain in the distance, animal hunting was again going to prove to be very tricky, not like the day before when we were graced with many Lions. After an hour and a half of searching we heard our friend Henry on the radio, he had just entered the Mara and was staying at the Mara Simba Lodge. He was on the lookout for Lions so we decided to join him on the search. 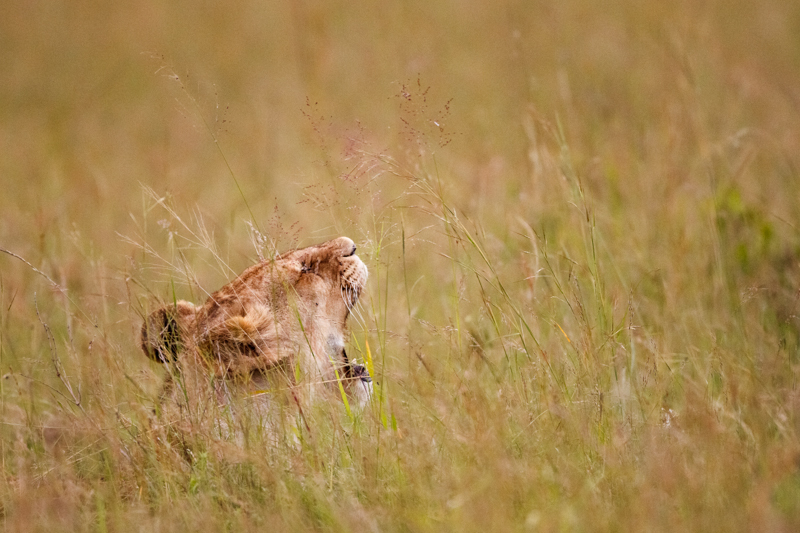 After much looking and scouring the long grass plains, we found what we were looking for…… but there was one snag. They were in the long grass, off track! “They” were a large pride. 15 Lions made up this pride, and we could just about see the top of an ear of only one Lioness. As the light faded and the air became much cooler we hoped that they would go on the hunt. We knew there was 15 lions laying in the grass as a ranger parked up nearby directed us to them. He was on the watch for any misbehaving drivers eager to please and chance breaking park rules. After 40 minutes of waiting it was time to leave. These Lions were not going to move for anyone. Then just as we started the van, a Lioness lifted her head and gave a yawn. I fired of a burst of shots and that was all we were getting this evening. Just as we made it back to camp, the heavens opened and the storm was upon us. We were in for a full night of rain. General Godfrey would need to use all his skill tomorrow, we were off to the Musaria Marsh and Billa Shaka area of the Mara. The most northern point in the Maasai Mara and home to the famous Marsh Pride, stars of the BBC series Big Cat Diary…… but what would the river crossings have in store for us?